(knee-ankle-foot-orthosis) to support her foot drop and right-side weakness that appeared as the result of an automobile accident in 1990. It's only one of a number of troublesome complications that also resulted from the accident but she lets none of them slow her down significantly. Although prior to the accident, Ballard was healthy, athletic, with no hint of a problem, the head injury that she sustained also activated symptoms of multiple sclerosis, which were only identified after more than a year of doctor visits and testing. Her seat belt lock had failed, allowing damage to her knee, as well. Ballard's variety of M.S. is called relapsing-remitting. "Each time that I have a flare-up, I lose a little bit of the strength in leg. The quad muscles on my right side are atrophying. I also have a lot of eye problems with it," she adds matter-of-factly. "The eyes sort of jump around, and I have had two eye surgeries for that." After the accident, Ballard was fitted for an ankle foot orthosis. Following her knee surgery, she began also wearing a knee brace. The series of braces she has worn ever since have been helpful in preventing more falls like the one that broke her wrist, and the thumb on her other hand. "The braces (one regular hinge and one pneumatic hinge) help give support to my hip," she explains. "My gait was altered and I was having problems, not swinging through properly. I had to go through gait training. The braces help to stabilize my knee. It's a prototype that was featured in a story about me a couple of years ago, that appeared in a national orthotics magazine." "The KAFO has made a great difference in her ability to stay mobile," she adds. "My orthopedist and Snell's have been very good about keeping me in the brace, and keeping it repaired. I wear it down, wear it out, Velcro comes off, and screws come out but I get to use it. I get tired. I experience fatigue and other side-effects of M.S., but it has helped me be able to walk better. I climbed Stone Mountain in Georgia with the aid of my brace. I climbed up it twice, in 1998 and 2001. Randy, at Snells, said I ought to climb DOWN it, now! I tried to come down both times, but I didnt make it. That's the next goal!" Although Ballard was recently diagnosed with leukemia, and her anemia adds to the fatigue that is already associated with her M.S. symptoms, she sets a demanding pace for herself as a dedicated volunteer. The love of her life in addition to her wonderfully supportive husband and 15-year-old daughter is serving as Scout Leader for "her girls". For ten years she has camped, hiked, and guided her group of high school-aged girl scouts through an impressive list of community service projects for the American Heart Association, the American Cancer Society, Habitat for Humanity, the Salvation Army, and others. 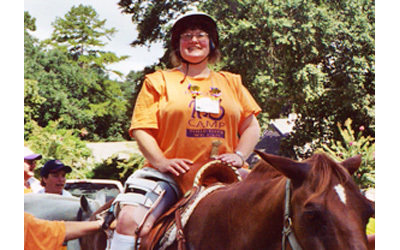 She and the scouts have also served at Buddy Camp, where children with disabilities are paired with typically developing peer children as partners or buddies. "I've been a Buddy Parent the past few years, and my girl scouts have been counselors. The girls are great," she says proudly. "When we go on a trip, they push me in the wheelchair, carry all the stuff, and take care of my backpack and luggage. They're a wonderful group." These educational (and entertaining) trips have taken Ballard and her girls as far as Disney World, Savannah, San Antonio, and this year, New York City. When she's not volunteering and mentoring, Ballard is busy bicycling and riding horses in what remains of her free time. "Dont give up, because Snell's will keep you going! They really will. Poor Randy! I've put him through so much. I've gone through water and everything else with that brace, and he is just wonderful and encouraging and very supportive. "I was playing basketball last year with my girl scouts, and a screw popped out. I wasn't even playing defense," she insists plaintively, "I was just going to shoot it!" Serious again, Ballard continues: "My orthopedist and Randy worked together to design a brace for me and they have both been very good about keeping me able to walk. So, I'd tell others in a similar situation not to give up."